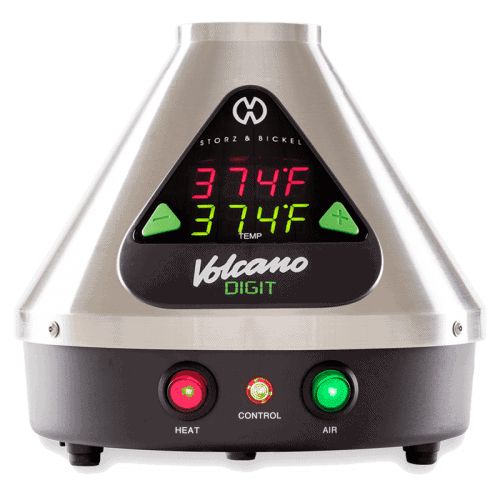 Once you’ve decided to get yourself a Volcano Vaporizer, one of the most perplexing things you’ll have to consider is Solid Valve vs. Easy Valve. When I bought by Classic, I got it with the solid valve bag set. For years this was all I knew. I dutifully cleaned my Volcano month after month to keep my solid valve in tip top shape. Then one day on a whim, I ordered some easy valve bags to try. That was 5 years ago, I haven’t looked back. Why? The solid valve gets sticky often. This finely engineered device looses performance and starts to bind when oils build up. The easy valve in contrast will continue to work no matter how dirty you let it get, thanks to it’s simple silicone flap valve. The easy valve is light weight and easy on the lips. Whereas the solid valve is heavy and can require a good amount of force to open, especially once it gets sticky. The easy valve is easy to clean. It’s very simple to disassemble the easy valve filling chamber and replace the screens without tools. The solid valve in comparison requires removing a small nut to replace the top screen. Not too difficult, but certainly not ‘easy’. The easy valve is ready to party! With the solid valve you only get one valve and mouthpiece. However with the easy valve you’ve got one valve and mouthpiece for you, and 4 of your friends. No more waiting. Everyone gets their own bag and can take their sweet time. Let’s say for argument’s sake you’re a heavy vaper who likes a clean bag every 3 weeks. That’s approximately 17 new bags a year. Comes with 5 balloons w valve and mouthpiece and filling chamber. So in our hypothetical first year, you will spend $139.85 if you use replacement balloons and re-use your easy valves by replacing the bag. Comes with 1 assembled balloon + 1 roll and filling chamber. So in our hypothetical first year, you will spend $139.85 as well. Where’s this leave us you might ask? Confused that’s where. Let’s look ahead to year two, this is where you’ll see savings. Generally I find I can replace the bag on my easy valve 4 times before I crack it or it just gets kinda dirty. So if I buy a replacement set of balloons for $59 and 6 rolls for $6.95 each, I will have what I need to make 30 fresh balloons – 1 each fresh out of the box + 4 replacements = 5 x 6 = 30. So my $100.76 investment will equal a $3.36 per bag cost. With the solid valve, I only have to buy replacement balloons. At $6.95 for the 10ft roll which makes 4 bags my per bag cost is $1.73 almost half the cost of my easy valve bags even if I replace them myself. However, that fails to factor in the cost of your time. Properly cleaning and replacing the bag on the solid valve can take 10-15 minutes depending on how dirty it is. I can clean up my easy valve with soap and water and replace the bag in under 5. Easy bags are the way for me. They might cost a wee bit more, but the benefits are worth it to me. Easy valve forsure. Solid valve is so much monotony imo. Plus constant leakage.